Insulated concrete forms are permanent, sandwich-type of forms, on which concrete is poured between two insulation layers. Today it is one of the strongest and energy efficient wall systems used in residential and commercial construction. The forms will stay in place as a permanent wall assembly forming walls when multiple blocks or panels are connected with plastic ties. Insulated Concrete forms are being used by contractors to qualify for energy credit and other types of ratings, LEED for example. Many home builders are using the most obvious and currently most popular alternative: Insulating Concrete Forms (ICFs). Not only home builders, approximately one-third of Insulated Concrete Forms structures are non-residential, according to the Insulating Concrete Form Association. These forms that will undertake the place of masonry, wood, or concrete, not only provide a continuous insulation and sound barrier, but also a backing for drywall on the inside, and stucco, lap siding, or brick on the outside. Insulated Concrete Forms will achieve, at a minimum, an R-17-plus wall that is permanently insulated on both sides with a solid concrete mass core. The blocks and panels also feature integral nailing strips for attaching interior and exterior finishes and the ability to “let-in” mechanical runs, such as wiring and plumbing, without cutting into the concrete core. However, wall penetration or piping running through the walls should be accommodated before the pour or block before the concrete is placed. If you decide to use ICFs for your next construction project, make sure you will bump up your estimate by 5% when compared to traditional wood framing units. 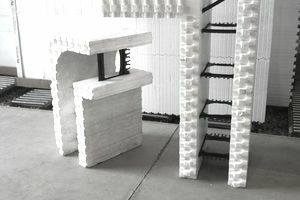 However, in order to promote your idea to the customer, make sure to highlight that the energy savings obtained during the life-cycle of the product will eventually offset the higher upfront cost of using ICFs. Studies show that ICFs can add between $3 to $5 per square foot. Insulated Concrete Forms can be designed on buildings and walls over 40 feet tall. AC1 318 must be followed to design an ICF Wall System, just like regular concrete walls. Less energy is required to heat and cool the interiors when compared to wood-frame structures. Insulated Concrete Forms can get R values from, R-17 to R-26, instead of having R-9 values from wood frames. When compared with wood framing, they will reduce infiltration by 50%. Insulated Concrete Forms are treated to be resistant to mold and mildew problems. Most ICF companies manufacture forms in 4", 6", 8" and 10" cavity widths, and several shapes. When remodeling, openings can be cut into the wall easily and accommodate the rough-in required. Every major construction code North America, including ICC, has approved ICF’s. It has twice the sound resistance property as wood frames, achieving a sound transmission classification of 50. No vapor barrier is required. The insulated forms act as regular moisture barriers. ICF buildings are up to 8.5 times stronger than wood-framed buildings. Insulated concrete forms do require waterproofing. There are various products, including latex sprayed waterproofing, peel and stick membranes, as well as dimple board sheets. Inserting new utilities is as easy as cutting channels or grooves directly into the form using an electric hot knife or router.